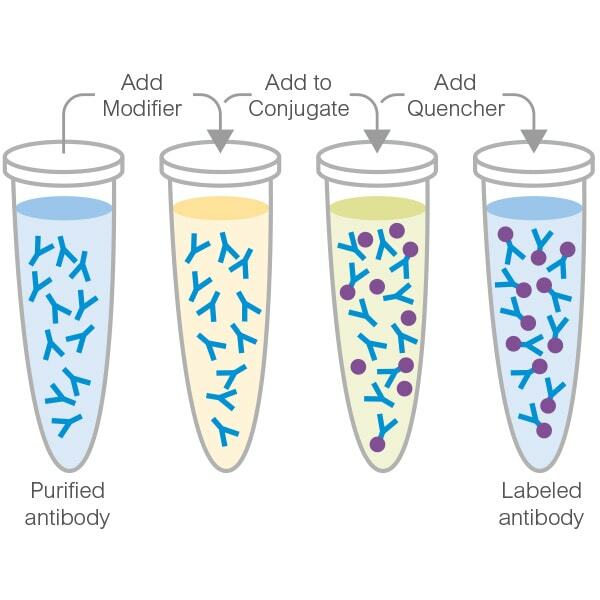 Is there a difference in sensitivity between these 2 types of antibody labeling kits? There is no difference in sensitivity between the rapid (eg. ab188285) and the standard (eg. ab102884) labeling kits. The only difference between the two is the incubation time required for the reaction. One of our customers is looking for an Anti-Enterococcus feacalis Ab, they would prefer that the Ab will be labeled by any florescence dye (FITS for example ). Unfortunately I didn't find, is it correct or I missed it? We offer them the Ab- Anti-Enterococcus antibody #ab19980 .On the detailed description it is written that the Immunogen is , E.faecalis,and on the alternative names are E. faecium antibody, E.faecalis antibody. Base on this is there any information about cross-reactivity of the Ab between the different types? This antibody will detect the whole cells, and because the antiserum has not been absorbed (only Protein A purified) it may react with related microorganisms. As this antibody is suitable for conjugation purpose according to the datasheet, I would like to sduggest your customer is having a look at our FITC conjugation kit. Inquiry: Dear Abcam, I have a novel protein that has been fused to Fc. I was wondering if your easylink antibody kits would be able to create a protein:fluorochrome conjugate if there is an N-terminal Fc fusion? As the protocols provided were optimised for labeling IgGs, we would recommend to adjust the amount of material added to the label vial to allow for molecular weight difference. This should be done without changing the volume added to the vial, as this could affect the conjugation efficiency. As a rough guideline, we would recommend changing the amount of material proportionally to the size difference with IgGs. An average IgG is about 160kD, therefore for a target that is ½ the size of an antibody (about 80kD), add ½ as much to the vial. Finally, please note the usual EasyLink requirements will still apply: the target should be purified, in a suitable amine free buffer and not contain any additives such as Azide, BSA, Tris or Glycine. I hope that this helps. If you have any additional questions please do not hesitate to contact me. Inquiry: In labeling an antibody with your Easylink, I would like to know to which residue you are attaching the reagent. How do you know it isn't attaching to the FAB portion? The labeling kit works by targeting free amines groups on your antibody. We therefore cannot guarantee that the label will not bind to the FAB area, however this would be the case for any other amine orientated labeling technology. Although this might seem like an issue , it does not mean that the FAB will become unreactive, and we see successful conjugations in the great majority of cases. The amine binding would only become an issue if there is an amine group within the antibody binding site itself. I am interested in buying few products from your company which i will be ordering frequently if satisfied. i observed that no purification is required after conjugating the labels to antibodies. what is the basis of such reliability? Does all labels bind to the Abs and there is no free label? Please answer my highlighted doubts and send me an electronic quote for the below mentioned address giving any discount (if applicable). I will have to double-check with the lab regarding glycosylation of the antibodies since I do not have this information readily at hand. I will let you know once I have received this information. I will email you a quote for the 4 products. Currently we are running a promotion where if you buy any primary, you can get a RabMAb for free! Just mention the code RABMAB-XBSMG on the order and the cost of the rabbit monoclonal antibody will be removed from the order. I hope this information helps. I will be in touch again with more information regarding the antibodies you requested. How much FITC (moles, ideally) is in each vial of the 3 x 100-200ug conjugation kit? We hope to achieve a ratio of 2 FITC molecules perIgG molecule. Is there any data for a reference antibody, demonstrating the number of FITC molecules conjugated per IgG, for a given starting concentration of IgG (e.g., 1mg/ml)and a given formulation (e.g., PBS, azide-free, carrier--free)? Thank you for your interest in the FITC conjugation kit. Unfortunately, it will be difficult to achieve a consistent ratio of FITC : IgG without extensive testing of the kit to determine the appropriate conditions. We have not done this testing, as the kit was developed for ease of producing a conjugate that simply gives a bright signal, rather than producing a conjugate of a known ratio. Further, the components of the reagents are considered proprietary, which makes knowing where to start difficult. To do what you want, I think it will make more sense to work with a standard FITC conjugation protocol, using known reagents and quantities, and testing various combination of FITC and antibody. What is the CAS number of FITC molecules used in kit ab102884? The fluorescein in ourKit is not simply fluorescein and it is not FITC either. Our fluorescein has been specially treated with proprietary Easy-Link chemistry to make the unique one-step conjugation possible. Inquiry: I have purchased the antiphosphotidylserine antibody (ab18005), and I am wondering about a standard protocol to use this antibody along with the EasyLink FITC Conbjugation Kit (ab102884) and EasyLink HRP Conjugation Kit (ab102891) also purchased from abcam. Because I have noticed in the data sheet that the Anti-PS is suspended in 0.1M Tris gycine, 30% Glycerol, and 0.15M Sodium Chloride, and in the EasyLink data sheet, it is mentioned that buffers wirh primary amino acids and Tris-based should be avoided. So how can I go around to conjugate the Anti-PS antibody with the EasyLink FITC? Is the quantity present in this antibody enough to be used with 2 EasyLink Conjugation kits, one with FITC and another with HRP? and how can I avoid thaw-freeze cycles to maintain the stability of the product if several phases of the experiment require multiple uses? Is there a way that the Ab can be resuspended in other vials and divided to be preserved and used upon need seperately? I can confirm that additives in the buffer of the antibody will interfere with the labeling reaction. https://www.abcam.com/index.html?datasheet=102776 (or use the following: https://www.abcam.com/index.html?datasheet=102776). We usually recommend to label 100ug of antibody with the kits you purchased to achieve an optimal result. This means that one vial of ab18005 is enough for only one conjugation reaction. It is possible to only use 50ug, but this is not optimal. After the labeling of the antibody we recommend to store it at 4C to avoid freeze /thaw cycles that will harm the conjugate-antibody-complex. Sodium azide can be added, but only to conjugate that are NOT HRP. HRP enzyme activity is inhibited by sodium azide.